[PS4] Uncharted is a solid entry in a franchise that never really falters. The gameplay might be a little repetitive, but it’s still engaging enough to be enjoyable. Too many frustrating chapters hurt this game a bit. And those jetski levels. Oh my God the jetski! A pretty well-made first effort for Naughty Dog into the shooter genre. The characters are fairly consistent and the story, while a little too Raiders-like, it fun. The controls needed to be refined, shooting mindless enemies is not very fun. The controls have not aged well, which leads to stale gameplay, but the story is still charming - even if generic (leading to the most enraging final levels of all time). It being mercifully short helps a lot. The most repetitive shooter ever made. My favorite part was the skeleton that had a beard, therefore it had to be Sir Francis Drake. A stellar story, charismatic characters, engaging dialogue, and luscious set pieces set "Uncharted: Drake's Fortune" apart when it launched all the way back in 2007, and those aforementioned attributes have truly stood the test the test. What hasn't, however, is the rudimentary, repetitive, and unending gun-play, which drags an otherwise spectacular PS3 debut from Naughty Dog down significantly. 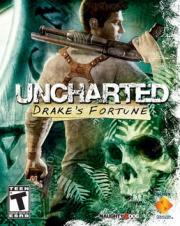 Still, as a piece of the greater puzzle, Nathan Drake's maiden voyage is far from a fool's errand.